SharePoint is a wonderful platform that allows you to build an impressive information architecture and specially to manage and categorize your documents and list items. We often advise our customers to use managed meta data, columns to structure and organize their content. 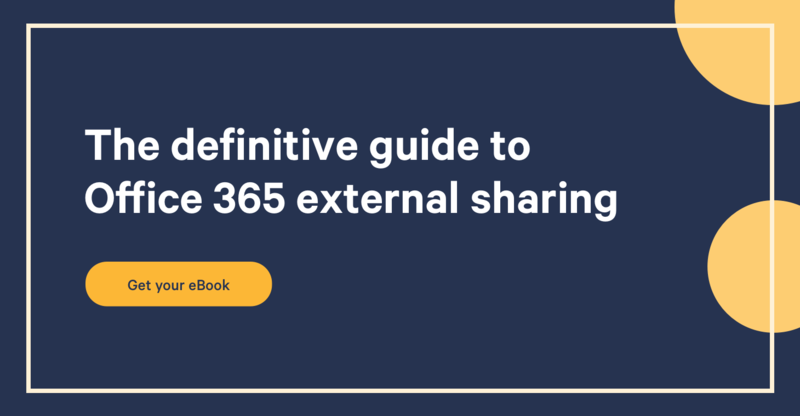 It’s better for retention and for the search feature for SharePoint On Premises and SharePoint Online. When built smartly, Content Types can have a huge power managing your information architecture. But I have to say it’s more common to see collaboration sites and intranets using content types with the same name, not inheriting from the same parent content type or having one or more different columns. Or even better, we sometimes see libraries with more than 100 columns not using a content type. If you need more information about Content Types please read these really helpful articles. What are Content Types in SharePoint? Learn how to create and use them. I think the biggest challenge comes when it’s time to reorganize Content Types. You never know where they are used, what the differences are between each other, and sometimes you want to delete one and you have the lovely SharePoint message “Content Type is Still in Use” giving you no clues about the location of the “use”. 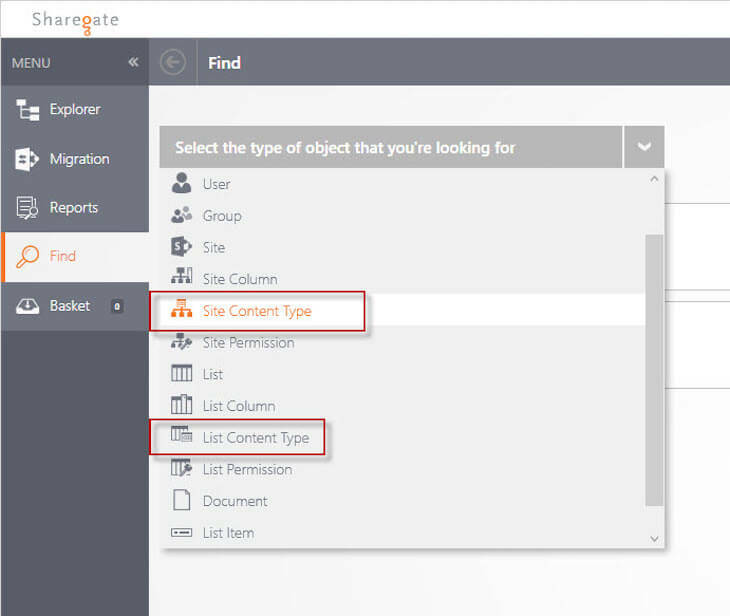 Luckily Sharegate can help you manage these Content Types. I’ll try to answer these common questions we have through a list of “How To”. 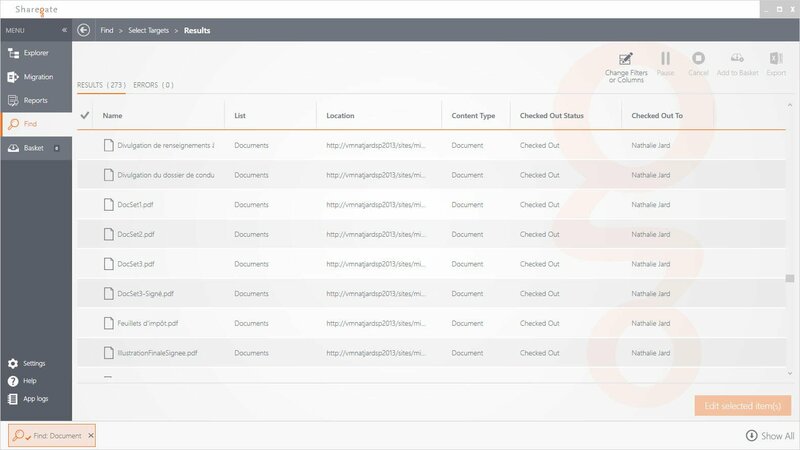 Using the Sharegate Find feature you can find all documents using a specific Content Type inside your environment. You can see quickly the results and then export them to Excel. Now you can see where they are used and you can manage them inside each list. You need to use the Sharegate Find Feature to obtain this list. I like to exclude all the SharePoint out-of-the-box Content Type from my queries so I can find all the customs Content Types. For example when searching for a List Content Type, I don’t want to see “Document”, “Item” or “Folder” content types. You only need to specify the names you don’t want to see. You can download my query here and import it in your environment. I’ve already made the list of out of the box content types so you won’t see them in your results. As you can see here I only have custom content types in my report. Again! 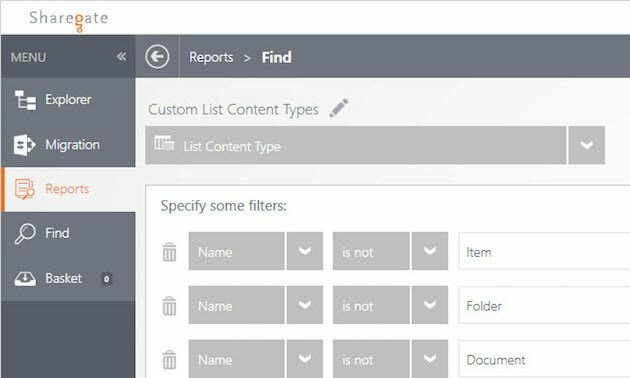 Start a new Find query and search for List Columns. When using filters you need to select a relation “List” and make a matches query. Content Type – is – Your Content Type name. As you can see in the results I only have the list of the columns being used inside this specific Content Type. Sometimes you just need to reuse the same Content Type from a site to another or simply from a document library to another one. 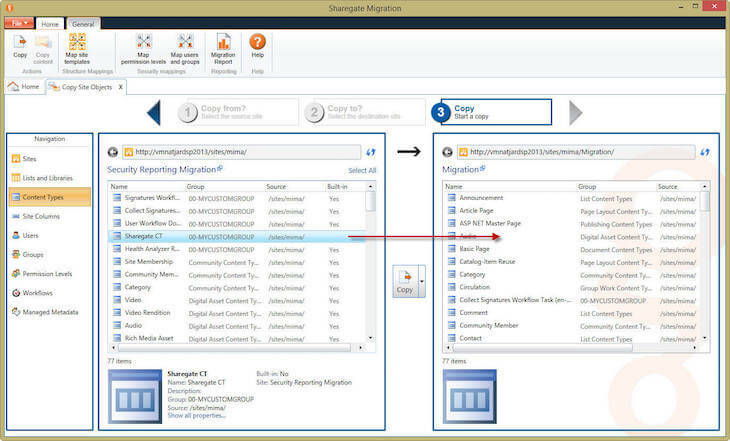 It’s really simple using the Sharegate granular migration feature. Automatically, Sharegate is going to move all the dependencies (the site columns for example) for you. If you need to apply this content type to a library you need to associate it inside SharePoint from the List properties. You can also copy a site or a library without the content to replicate your information architecture. The Find feature has got real power for reporting needs. Once you know what you’re looking for you can build any report you need and use them for your SharePoint management tasks. The Sharegate team has already built reports for you (they are in fact Find queries pre-saved) you can use or adapt them to your needs. Don’t forget that you can always save your query inside the Report library, export it and share it with your colleagues, and Excel export is always available inside our reporting.